The slight deceleration of U.S. commercial P&C rate declines witnessed in recent months has come to an end, as rates declined by an average of 2% during May 2016, the same as in April, according to data from MarketScout and Keefe, Bruyette & Woods (KBW). “The market was stable in May with small movements in coverage, industry, and size classification. As we have seen in the past, larger premium accounts were priced more aggressively. Overall, the composite rate was down 2 percent in May, matching the rate for April,” said Richard Kerr, Chief Executive Officer (CEO) of MarketScout. Pressure remains on commercial insurance rates, with some of the cause being the over spill of excess reinsurance capital into primary commercial business, as well as the ingress of alternative or third-party reinsurance capital which is increasingly targeting more direct access to commercial property risks. The latest MarketScout U.S. commercial P&C market barometer, which tracks the monthly rate movements of U.S. commercial P&C business by coverage class and account size, reveals that on average rate movements in the sector remained flat when compared with the previous month (although 2% down y-o-y). As shown by the chart below, provided by KBW, year-on-year, P&C rates declined by an average of 2% during May, in line with April which saw a further, albeit slight deceleration of reductions when compared with March and previous months. 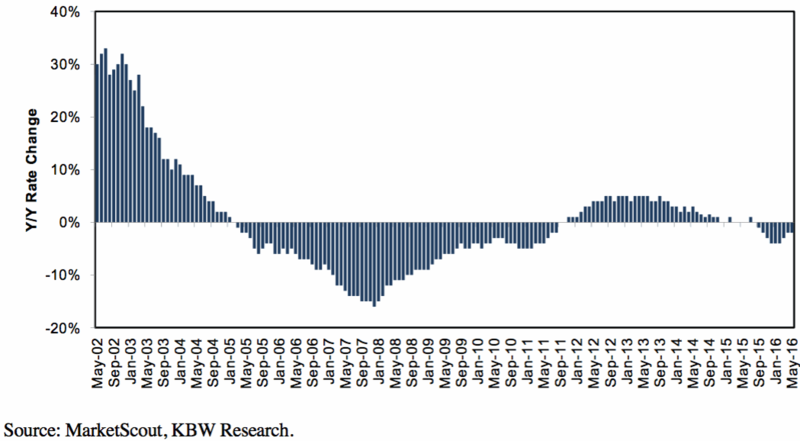 “Rate decreases clearly trail even benign loss cost inflation, so accident-year underwriting margins will almost certainly contract, dependant upon individual companies’ loss reserving conservatism,” said KBW analysts. Artemis discussed last month how analysts at KBW and MarketScout’s Kerr expressed doubt that the recent deceleration trend would persist much longer, and the movements witnessed in May support this. As noted earlier by Kerr the larger premium accounts experienced more aggressive pricing during May, evidenced by the fact that by account size, large ($250,001 – $1 million) sized, and jumbo (over $1 million) sized accounts were down 3% in May, compared with 2% in April. Small (up to $25,000) sized accounts and medium ($25,001 – $250,000) sized accounts remained unchanged during the month, declining by 1% and 2%, respectively. As well as by account size MarketScout’s monthly insurance barometer also provides insight on rate movements by coverage class, revealing that during May, property, business interruption, professional liability, auto, D&O, and surety all moderated by 1% when compared with April. General liability and EPLI remained flat during May while crime coverage actually increased from flat to plus 1%, with all other coverage classes down by 1% to 2% in the month, reveals MarketScout. It will be interesting to see if year-on-year average U.S. commercial P&C rates remain at -2% during June, or whether recent deceleration and stability transitions to an acceleration of rate reductions. MarketScout and KBW warned that recent stabilisation and several months of deceleration was unlikely a sign that the softening landscape was beginning to turn, and rate movements in May suggest their predictions were correct.